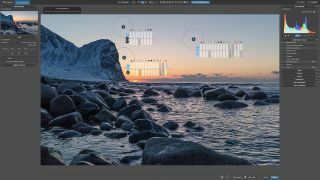 Fresh from its acquisition of the Nik Collection from Google at the tail end of 2017, DxO has announced an update to the collection of Photoshop and Lightroom plugins, as well as a refresh of its own PhotoLab post-processing software. Let’s take a close look at what’s new. This collection is now fully compatible with all 64-bit Windows and Mac platforms, with Adobe Lightroom Classic CC, Photoshop CC 2018 and Photoshop Elements 2017/2018. The firm has also sought to make the software more universally accessible, with website support available in four languages and the software itself available in thirteen. Also included in the plugins is U Point technology, which allows highly specific local adjustments to be made to images. The Nik Collection 2018 is available now for download on the DxO website. Its UK RRP is £59/$69, although if you snap it up before 1 July you can get it for a special introductory offer of £39.99/$49.99. This is the latest version of what was formerly known as DxO Optics Pro. It’s a complete Raw and JPEG processing package, using the highly mathematical methods DxO is famous for. One of the headline updates is the integration of Nik’s U Point technology, following the acquisition from Google, which means photographers can "apply local settings in a non-destructive Raw stream to specific areas in an image." Version 1.2 also comes with Hue (HSL) and Selective Tone settings, which allow for selective local recovery of highlights and shadows. The tool’s equaliser system has been altered to reflect the additions, with local settings grouped into the categories: Light, Color and Detail. There’s also a new keyboard shortcut to show the U Point mask in greyscale and to indicate the area that’ll be affected by its correction. DxO has also added some new camera profiles from recent releases, allowing it to automatically correct optical defects. The new additions concern the Sony A7 III, Panasonic Lumix G9, Panasonic Lumix TZ90, Panasonic Lumix GF9, Canon EOS 2000D, iPhone 8 Plus and iPhone X.
DxO PhotoLab comes in two versions, Essential and Elite, which can be downloaded from the DxO website for £99/$129 and £159/$199 respectively. Owners of DxO Optics Pro can upgrade for free, and there’s also a free one-month trial version available.